Carmelo Garcia the embattled, controversial Director of the Hoboken Housing Authority sent a letter to MSV late Friday afternoon claiming this website published a "false and defamatory article" about the agency. The letter accused MSV of publishing an article stating there was a FBI investigation of the Hoboken Housing Authority. The letter signed by HHA Chair Rob Davis and copied to HHA counsel Charles Daglian arrived via email. The letter follows a call by Carmelo Garcia to the HHA commissioners at the last HHA meeting to denounce MSV but saw neither a resolution or vote. Thank you for your response to my initial inquiry on outside agencies visiting the Hoboken Housing Authority. Unfortunately, you have misread my story. I would be happy to publish your statement so the truth or falsity of it can be evaluated by the MSV audience. Since my story never mentioned the Federal Bureau of Investigation, there's nothing to address in the incorrect assessment you allege in your letter. A week earlier on Labor Day Friday, rumors were flying the HHA was being visited by unknown Federal agents. MSV reported that information and made more than a half-a-dozen phone calls to the HHA office and CFO seeking clarification. No reply or answer was forthcoming. 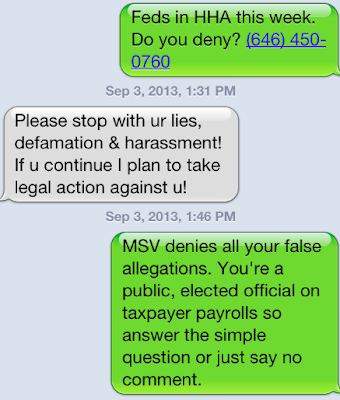 Given an opportunity to fully answer a question (and MSV knows it wasn't the only media asking,) note the response does not address the simple question but claims victimization and makes a threat he will take "legal action." Carmelo Garcia is paid $165,000 a year as a contractor to the HHA and another $5,000 to be some sort of liaison to the Hudson County Freeholder Anthony Romano. Is this the appropriate way to respond to a simple public issue question when you are drawing $170,000 in salary plus an extremely generous benefits package from taxpayers? Talking Ed Note: MSV in its email reply further invited Carmelo Garcia to provide additional information on visitors of a state or federal origin at the HHA inspecting the premises, its office/property or equipment including boiler rooms. Further, Carmelo Garcia is invited to do likewise regarding his own recent personal interaction. MSV will not acquiesce to threats, defamation and/or First Amendment attacks and stands by its story. Anticipate more news forthcoming out of the HHA.